Precious metals futures declined on Tuesday. Sliding from a 15-month high, gold’s loss was its first in seven sessions. Gold for June delivery dipped $4, or 0.3%, to settle at $1,291.80 an ounce on the Comex division of the New York Mercantile Exchange. "The gold market saw some modest profit-taking pressure kick in from the shorter-term futures traders at late-morning Tuesday," Jim Wyckoff, a senior analyst at Kitco Metals Inc., said in a report. "The U.S. dollar index also saw a corrective bounce today, after notching an eight-month low overnight. The firmer greenback today and weaker crude oil prices were also negative outside markets for the precious metals on this day." 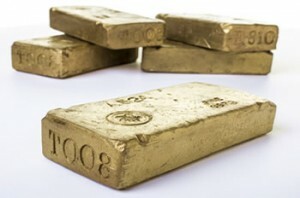 Gold prices traded from a low of $1,284 to a high of $1,303.90. They advanced 0.4% in the prior session and settled at their best level since Jan. 22, 2015. Falling for a second day in a row after climbing for six straight sessions, silver for May delivery shed 18.3 cents, or 1%, to close at $17.499 an ounce. Silver prices ranged from $17.36 to $17.76. On Monday, they fell 0.8% and logged their first decline in six sessions. July platinum dropped $14.80, or 1.4%, to $1,071.60 an ounce, trading between $1,065.10 and $1,092.30. Palladium for June delivery declined $15.90, or 2.6%, to $608.85 an ounce, ranging from $600.40 to $626. Gold added $8.35, or 0.7%, to $1,294 an ounce. Silver declined 36 cents, or 2%, to $17.49 an ounce. U.S. Mint bullion sales were unchanged Tuesday as of 3:03 p.m. Eastern Time. The U.S. Mint this week allocated sales of American Silver Eagles to 1,085,500 coins, which includes 85,500 coins carried over from last week. Distributors order 62.2% of them on Tuesday. 2016 Silver Eagles are at a record sales pace of 19,590,000 coins, marking a 31.3% increase over the same time in record year 2015. Below is a sales breakdown of United States Mint bullion products with columns listing the number of bullion coins sold during varying periods.